In 10 Quick Facts on OSHA's New Silica Dust Rules, we explained how OSHA is cracking down on airborne crystalline silica. In a concerted effort to eliminate the numerous health problems linked to the dangerous dust, OSHA is reducing silica’s permissible exposure limit (PEL) to 50 micrograms per cubic meter of air over 8 hours – a considerable change to the original limit. Because of this, many businesses will have to measure (or re-measure) potentially dangerous work areas to prove they comply with the new regulations. The only way to measure for airborne silica dust is to take samples of the air in necessary workplaces and have them analyzed by a lab. This guide will outline the necessary steps to acquiring an acceptable sample. Airborne silica dust is measured by using a device called a sampling cyclone. This is a relatively small piece of equipment that clips on to a workers shirt and connected to a pump (usually attached to the worker’s belt or back pocket) that draws air from the surrounding environment. The cyclone creates a sample from the air drawn from the pump that then can be shipped directly to a certified lab (read Appendix A for certification outline) for testing. NOTE: You might have heard that a device called an impactor is sufficient for silica sampling. However, in general, it is not a recommended sampling method. OSHA’s rules call out the cyclone as the preferred sampling device, and although the new regulations say you can “optimize the testing method,” you most likely can’t change the technology. If you need to use impactors, make sure to receive something in writing from OSHA clearly stating approval of the device. Remember, people go to court over this and have to defend the data, so try not to veer too far from the approved method. There are several types of cyclones available that you can use to take air samples. Each accomplishes the same task, but some cyclones are designed to handle low air flow rates, while others can handle relatively high air flow rates. This article will explain the importance of air flow, highlight specific cyclone options, and show how to select which one is best for your particular application. The pump draws a measured amount of air into the cyclone. It is imperative to use a pump that has “constant flow control” functionality. This allows the pump to automatically increase the flow rate when it senses backpressure buildup as the filter fills up with particles and blocks the flow (just like a car’s cruise control increases RPMs to maintain speed when it senses a hill). Most personal monitoring pumps have it, but some built for asbestos sampling do not. One of the most important aspects of air sampling is the cyclone’s flow rate. The flow rate allows the cyclone to mimic the human respiratory system as closely as possible so accurate samples can be taken. Perhaps unsurprisingly, the United States and Europe have different flow rate standards (the United States operates cyclones at faster rates than Europe). The problem is that many of the cyclones available on the market are sold globally, so they come with two different flow rate options. It is imperative to make sure you are using the correct flow rate (this will be outlined in the directions that come with the cyclone). Always observe the cyclone flow rate to make sure you’re using the right flow rate for the 50% cut at 4 microns to follow the ACGIH curve. However, as the table below shows, there are other options. With the recent, more stringent regulations, larger cyclones have been designed to achieve commensurate sample sensitivity. 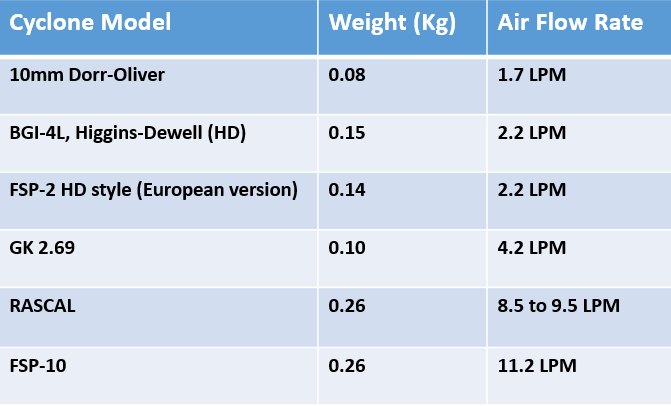 The table depicts The Big Three as well as other cyclone options and their respective weights and air flow rates. Which Cyclone Should You Use? Since OSHA’s rules don’t limit you to a specific cyclone, you’re probably wondering which one is best for your situation. Although The Big Three are the most popular, there are applications where they simply won’t cut it, especially with the new regulations. So, per usual, the answer is…it depends. That being said, there is one particular cyclone that should work in 95% of sampling applications: the GK 2.69 (and we’ll explain why shortly). Testing method’s published Limit of Detection – specified by the lab doing the analysis. Note: Always ask the lab to include the limit of detection in the lab report. Let’s say you already have a Dorr-Oliver cyclone and you want to make sure it can provide testable samples. We know it has a flow rate of 1.7 liters/minute (lpm), this is provided by the manufacturer. Looking at the six OSHA-accepted lab testing methods (right), we know the silica detecting limit of each testing method. (This number is the amount of silica the lab can detect, so for NIOSH 7500, the lab can’t detect less than five micrograms of silica. This number will be provided by the lab.) Let’s say you want to test your samples using the NIOSH 7500 method. Now we just need to find out the limit of detection in micrograms/m3. Since 6.12 is less than 12.5, your Dorr-Oliver cyclone is fine to use. Problems begin to arise when your Length of Task decreases. For example, if your task lasts only 180 minutes (4 hours), your LOD will come to 16.33 micrograms/m3. Remember, we can’t go over 12.5. In these situations you need to increase the flow rate to obtain a bigger sample. If you have a Dorr-Oliver then you will need a larger cyclone. “Upgrading” to a GK 2.69 is probably a good bet. This example highlights why the GK 2.69 is probably going to work for 95% of situations; with a 4.2 lpm, it’s quite capable. Nevertheless, you can see how this can turn into a small game: find the combination of numbers that will get you below the 12.5 microgram/m3 limit, and whatever the flow rate comes to signals the corresponding cyclone to use. The last thing to factor into your cyclone decision, is the weight of the actual cyclone. After going thought the example above, you probably thought to yourself “why not just go for the biggest cyclone?” A logical thought, but the problem is that the larger the cyclone, the heavier it is and, hence, the more unwieldy and uncomfortable for workers to wear. When NIOSH first began testing the larger cyclones, they received numerous complaints regarding size and weight. So, in short, don’t use the largest cyclone unless it’s absolutely necessary. Looking at the table above again, you can see the GK 2.69 is weighs on slightly more than the lightest option (the Dorr-Oliver), confirming that it is a solid option for most applications.